LIFEPAC Accounting, a ten-unit course for grades 7-12, is a wonderful supplemental math course for student's who want to pursue a math or accounting degree, own a business, or enjoy money management. This course covers units like: Analyzing and Journal Transactions, Posting to the General Ledger, Financial Statements, Payroll Records and Accounting, and Adjusting Closing Entries. Students jump into worktexts filled with easy-to-understand lessons and colorful illustrations. Worksheets like payroll records are included to aid comprehension, along with question and answer sections and tests. Filled with lessons to aid comprehension, this course emphasizes mastery learning techniques so student's can work independently with confidence. 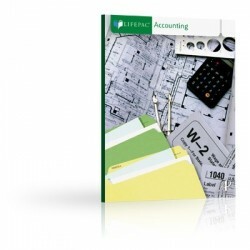 LIFEPAC Accounting contains ten worktexts and a teacher's guide. And topics studied are what your child will need to know in real life! Flexible, self-paced lessons cover concepts like transactions, posting items to a ledger, worksheets, financial statements, recording payroll, taxes, and more! Designed for grades 7-12, this math elective is a wonderful supplement for students who want to pursue a math or accounting degree, own a business, or enjoy money management. And instead of one huge, intimidating textbook, this encouraging Alpha Omega curriculum is divided into ten separate worktexts to encourage student learning! But there's more! To aid comprehension, this step-by-step course emphasizes mastery learning techniques so students can work independently with confidence! Daily instruction and application as well as quizzes and tests for evaluation are all included. And to assist parents, the LIFEPAC teacher's guide contains must-have information like teaching notes, answer keys, alternate tests, and an abundance of enriching activities. What could be more convenient? Try this best-selling, Bible-based curriculum to see how fun teaching accounting can be—just order LIFEPAC Accounting today!